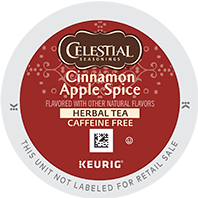 This warm and comforting herbal tea is dominated by spicy cinnamon and sweet all-American apples. Roasted carob brings a hint of chocolate to the finish. It’s naturally caffeine free, so it can be enjoyed any time day or night.